This is a good description of a big portion of our culture today, isn’t it? The light of truth is not shining in their minds – their thoughts are confused and fluctuate with the latest popular trends. The light of love is not shining in their hearts – they have turned inward and cynical, victims of their own limited perspectives. 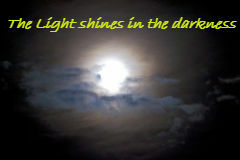 But those of us who have accepted Jesus’ grace and love and salvation have seen the light that shines in the darkness. The light of God’s mercy shines in our lives every day as he helps us love ourselves and love others with his love. We will never understand it all – that’s where faith comes in. We still mess up regularly – that’s where grace comes in. But we know the light and that’s where joy comes in. Please guide our feet into the path of peace, Abba Father.